Yu-Gi-Oh! 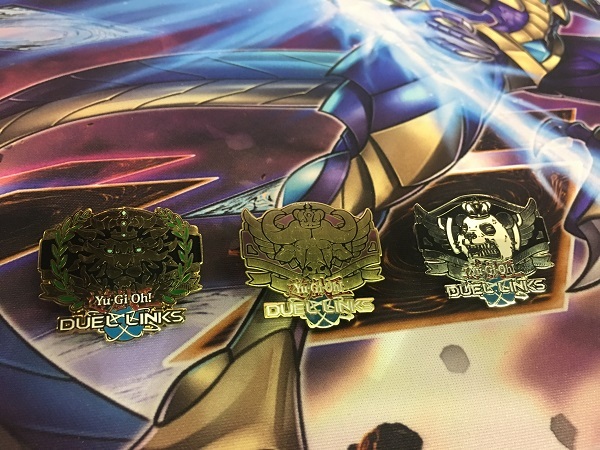 TCG Event Coverage » Check Out These New Duel Links Prize Pins! Home > 2019/02 - Chicago, IL, Yu-Gi-Oh! Championship Series	> Check Out These New Duel Links Prize Pins! Check Out These New Duel Links Prize Pins! Duel Links tournaments are back with brand new prizes at YCS Chicago! 8-player Single Elimination Duel Links tournaments will be run throughout the weekend, with prizes going to the Top 4 Duelists in each tournament. The first place Duelist will receive a pin featuring the icon for the “King of Games” rank of PvP Dueling in Duel Links. The second place Duelist will receive a pin featuring the icon for the “Legend” rank of PvP Dueling in Duel Links. The third and fourth place Duelists will receive a pin featuring the icon for the “Platinum” rank of PvP Dueling in Duel Links. These are the first, second, and third ranks in Duel Links PvP, represented by a lion, an ox, and a bear respectively. If you’re a Duel Links player at YCS Chicago, don’t miss this first opportunity to get these exclusive pins!